The Writers' Strike is about to end. The union voted to approve a settlement. Here are the major terms. The LA Times Strike Zone is here. No word yet on how this will affect the striking Hollywood writers, but the film and TV directors have settled with the motion picture industry. Hollywood’s movie and television directors agreed Thursday afternoon to a new contract with production companies. The accord would appear to send a none-too-subtle message to striking screenwriters: This is not the time to get hung up on new media. The Golden Globes are airing tonight with a bunch of readers from Entertainment Tonight, E!, the Insider and other gossip shows presenting the awards, poor audio that cuts out frequently, no stars and on CNN, Larry King talking over the readers. The audience, which isn't shown, consists of 600 studio execs and other such types. If anyone doubted the Writers' Strike is having a huge impact on the entertainment industry, this should remove them. The Oscars could meet the same fate next month. Yesterday the AMPTP has hired some big gun PR guys who have Democratic connections. The AMPTP announced yesterday that it had retained Mark Fabiani and Chris Lehane of Fabiani & Lehane and Steve Schmidt of Mercury Public Affairs "to assist in communicating the industry's proposed New Economic Partnership." Fabiani and Lehane have a long history in Democratic politics, serving as senior aides and advisors to President Clinton, Vice President Gore and other Democrats across the country. Lehane is currently in the Hillary camp. Schmidt is a Republican guy, so nothing we can do there. We would like to get blogs to write about this to put pressure on these guys. The idea that people who work closely with Dems would help to bust a union is disgusting. Hopefully we can pressure them to drop the job. And a new way to support the writers: Tell the Networks How You Feel. CBS news writers may be the next to strike. Today, they authorized the Writers Guild to call a strike on their behalf. CBS news writers, graphic artists and other staffers who work for the network's television and radio news operations voted by a wide margin to authorize a strike against their employer, the Writers Guild of America announced today. Of the 300 employees who cast ballots in last week's special election, 81% backed a labor stoppage to protest working for more than 2 1/2 years without a contract. If a labor stoppage were to occur, all-news radio stations such as Los Angeles' KNX-AM (1070) and KFWB-AM (980), Chicago's WBBM-AM and New York's 1010 WINS and WCBS-AM probably would be the hardest hit, as they would lose the staff that pens their news and headlines. The tv writers' strike and the Broadway stagehands strike continues. In a joint statement, the Writers Guild of America and the Alliance of Motion Picture and Television Producers said both sides had agreed to return to formal negotiations. The statement said no other details would be released. 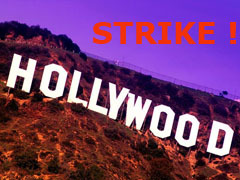 Jay Leno, Julia Dreyfuss, Ellen DeGeneres, Tina Fey and other big stars are supporting the striking Hollywood writers. Barack Obama said he stands with the writers and urged producers to work with them to end the strike. Hillary Rodham Clinton called for a contract that recognizes the contributions writers make to the entertainment industry. Has John Edwards weighed in yet? Day One strike news here and here. Mediation talks failed, the writers are on strike. One of the sticking points: How much the writers should be paid when their shows are sold over the internet. The question now is no longer whether or when they will strike, but how long a walkout will last and how much pain it will inflict. Both sides are girding for what many believe will be a long and debilitating strike, potentially more disruptive than the 22-week walkout by writers in 1988, which cost the entertainment industry an estimated $500 million. The Hollywood Writers Strike will start Monday. There will be a "last ditch" effort to avoid the strike Sunday when both sides meet with a federal mediator. On one side: "CBS Corp.; NBC Universal, a unit of General Electric Co.; and The Walt Disney Co., owner of the ABC network." On the other: Writers Guild of America. First casualties, probably Monday night: the late-night talk shows, from Leno and Letterman to Jon Stewart and Stephen Colbert. All are expected to go to repeats. After that: Day time talk shows and the soaps. What the writers are fighting for: a fair share of the profits from dvd sales and internet programming. What to do instead of watching tv? Read more blogs. Support the writers.